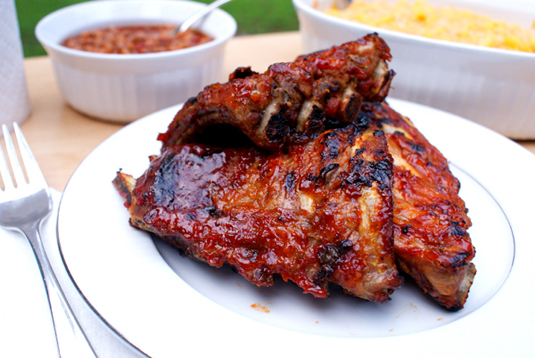 Oven Baked BBQ Baby Back Ribs are mouth-watering, tangy, juicy, tender and perfectly portioned! Someday I'll own a smoker. My Step-dad has one. It's not much to look at, second hand in fact. But, let me tell you, once I tasted the smokey rustic hunks of meat that come out of that rickety old thing, I was in love. I swear it's not really a smoker, but in fact a doorway to barbecue heaven. I would smoke meats all day long if I had one; ribs, chicken breasts, sausages, beef brisket, ham. I'd be a smoking fool. But alas (insert dramatic sigh here), I do not own one. So, until I can one day say that I do, I'll be baking my ribs in the oven and finishing them off for a few minutes on the grill to get the job done. Oven baking your ribs won't leave you with the authentic smoke taste of a smoker, but I assure you, this method will yield some of the most mouth-watering, tangy, juicy, tender, perfectly portioned ribs you'll ever taste. If you have time to get all the prep done the day before, all the better. You can get the foil packs ready and store them in the fridge overnight so the meat can marinate in the flavorful barbecue sauce. Makes for a no fuss and sure to impress meal the next day. And just think, you can enjoy the taste of a summer BBQ all year long if you bake 'em in the oven. Sounds good to me. Update: I am now the proud owner of a smoker bought at a yard sale for $10. That's what I'm talkin' about. Combine all of the ingredients for the barbecue sauce in a medium saucepan and bring to a boil over high heat. Reduce heat to medium and simmer uncovered for 30-45 minutes until sauce has thickened to your desired consistency. Remove from heat. Cut the rack of ribs into 3-4 sections. Each piece should easily fit on a plate and be a good serving size for one person. Tear off one piece of aluminum foil for each section of ribs. The aluminum foil pieces should be at least 6-8 inches longer than the length of the ribs. Coat both sides of the ribs with barbecue sauce and place lengthwise in the center of the foil. Each section of ribs should be in its own foil packet. Wrap tightly and place seam side up on a cookie sheet. Bake in the oven for 2-2½ hours. You know that they are done when the meat has shrunk from the cut end of the bones about a ½ inch. Remove the ribs from the foil and re-coat with more barbecue sauce. Grill for 2-4 minutes on each side, or just until you start to see small charred black spots. Be careful not to burn them! If the flames are touching the meat, they'll burn in a heartbeat! Serve with extra sauce on the side for dipping. Source: Taken from the book "Top Secret Restaurant Recipes".